This costume will make everyone do a double take! The cutest walking teddy bear costume with arms ever seen! 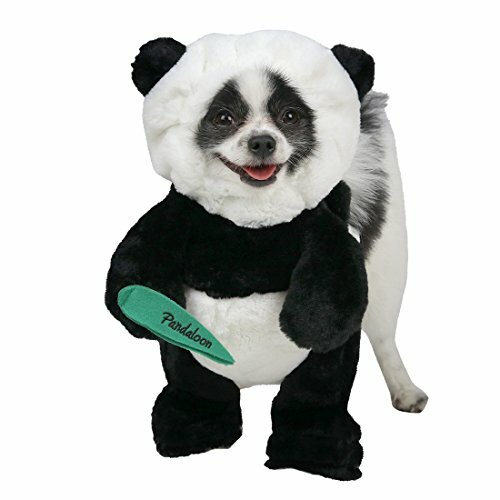 The Pandaloon Panda Puppy costume is perfect for taking photos, Halloween costume contests, brief trick or treating events, birthdays, Christmas and even surprising a special someone with a gift or proposal. The velcro accessory may be replaced with a small gift for a wedding or engagement ring. Product Size Detail: Size 1: Total height 13-14.5 inches (paws to ears), Girth 10-16 inches Weight may vary widely, based on build, much like humans can vary in appearance despite being the same weight so please measure. Size 2: Total height 15-17 inches (paws to ears), Girth 12-17 inches (For reference, you can use an iPhone 6 or 7 to measure 5.4 inches in height. An iPhone 6S or 7S plus is 6.2 inches.) Face opening may be adjusted up to a 4-5 inch diameter. If your pet has a wide face, such as a bulldog, please measure face or be prepared to make alterations. Dogs come in incredibly different shapes and sizes so please make sure to measure your pet's height for the best chance of an awesome fit. The patent pending costume allows for girth customization and leg length with 1-2 inches of adjustment. Huxley the Panda Puppy (pictured) weights 4.5 lbs and wears a size 1, standing 13 inches tall. Fluffy and stout dog friends weighing up to 10 lbs have worn size 1 because they are a similar height. Most Size 1 dogs correspond to boutique (small dog) sizes of XXS-XS. Most Size 2 dogs correspond to boutique (small dog) sizes of XS-S. Height is the critical measurement. This costume was designed in the USA and created by a woman owned small business. Great care in the design, fit and engineering went into delivering the best walking character costumes for our beloved pets. AWARD WINNING COSTUME SET - Patented design with over 150 million video views seen on Crazimals, Unilad, Viral Thread and more. Size 2 fits most small dogs 15-16.5 inches tall (TOTAL HEIGHT from head to toe, not shoulder), GIRTH under 17 in (shoulder to shoulder width 4-7 in), HEAD width under 6 in and under 12 lbs (unless your dog is muscular, thus smaller). Please measure! This is a jumpsuit, not a sweater, so sizing must be measured. For very small dogs, typically under 14 lbs. Please measure as weight does not guarantee body size.We try to accommodate as many shapes as possible, but please note sizing can vary! If you have any questions about this product by Pandaloon, contact us by completing and submitting the form below. If you are looking for a specif part number, please include it with your message.